Since 1999 Savvygardener.com has been the Kansas City area's favorite resource for gardening, lawn & landscape advice. 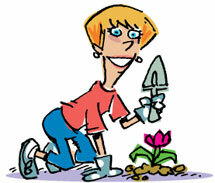 Thousands of area gardeners read our newsletter each week! Sign up today to receive the following via e-mail - absolutely free! Just enter your e-mail address below to start receiving the Savvygardener Newsletter!